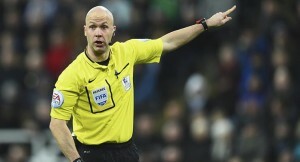 This week’s spotlight for our man in the middle falls on Anthony Taylor, who was appointed the referee for the Swans v Stoke City Premier League game on Sunday, 13th May 2018. Interesting Fact: During his first game of the 2011-12 season, he sent off three players in Middlesbrough’s win at Leeds United – two from Leeds and one from Middlesbrough. In my opinion Anthony Taylor is one of the gang of three, along with Graham Scott & Robert Madley as the worst referees in the Premiership. Swans will get nothing from this game with Taylor in charge – he’s cost us a lot of points over the years.